↑ Hacking, Ian (1990), "A Universe of Chance", The Taming of Chance, pp. 200–215, Cambridge U. Pr. ↑ Stigler, Stephen M. (1978). "Mathematical statistics in the early States". Annals of Statistics. 6: 239–265 . JSTOR 2958876. MR 0483118. डीओआइ:10.1214/aos/1176344123. ↑ Crease, Robert P (2009). "Charles Sanders Peirce and the first absolute measurement standard: In his brilliant but troubled life, Peirce was a pioneer in both metrology and philosophy". Physics Today. 62 (12): 39–44. डीओआइ:10.1063/1.3273015. ↑ Cadwallader, Thomas C. (1974). 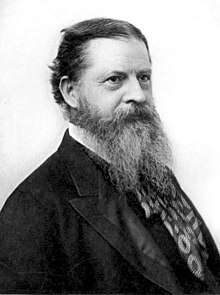 "Charles S. Peirce (1839-1914): The first American experimental psychologist". Journal of the History of the Behavioral Sciences. 10 (3): 291. डीओआइ:10.1002/1520-6696(197407)10:3<291::AID-JHBS2300100304>3.0.CO;2-N.
↑ Nöth, Winfried (2000), "Charles Sanders Peirce, Pathfinder in Linguistics", Digital Encyclopedia of Charles S. Peirce.